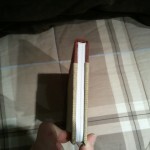 This is the fourth book I’ve bound, and I’ve learned an awful lot working on all of them. More below. 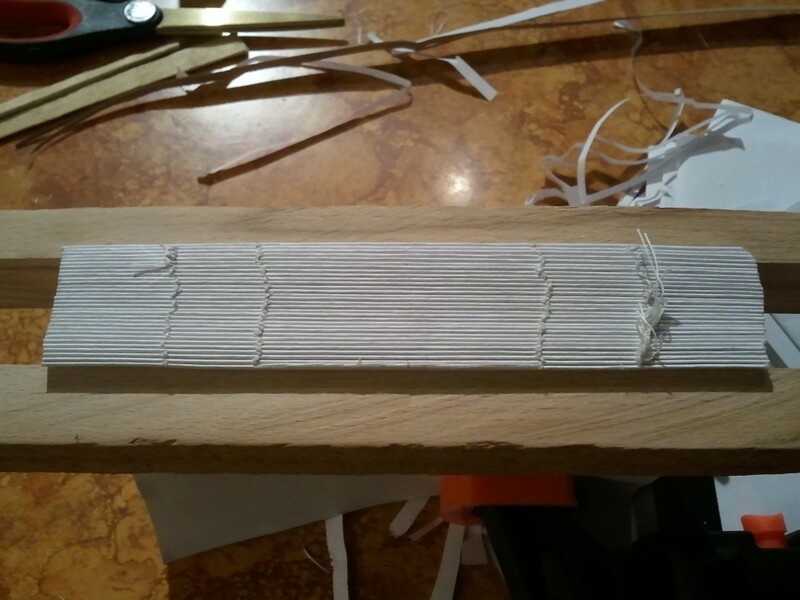 At first, I thought that the most complex aspect of bookbinding would be the binding itself — the physical stitching and gluing and cutting and such. The content was just words on a page, and the aim was to get the words to flow from page to page. After my first book, I realized how wrong I was. Certainly, the binding itself wasn’t exactly a cakewalk, and I made a lot of mistakes, but by and far the most horrible, glaring screwup was the way I’d laid out my pages. Everything was cramped, I’d left no allowance for gutter margin, so my text all ran into the spine of the book. It was virtually unreadable, and certainly something that needed a lot more work. I started researching book page layout, and I discovered a whole world of rules, guidelines, and psychology involved in page layout that I’d never considered before. Considerations on the typeface to use, type spacing, leading, line spacing, and margins have been all carefully and painstakingly researched, going back to some of the first books printed. Armed with this knowledge, I revisited my page design, coming up with a layout based on the common elements of the canons of page construction that date back to the middle ages. 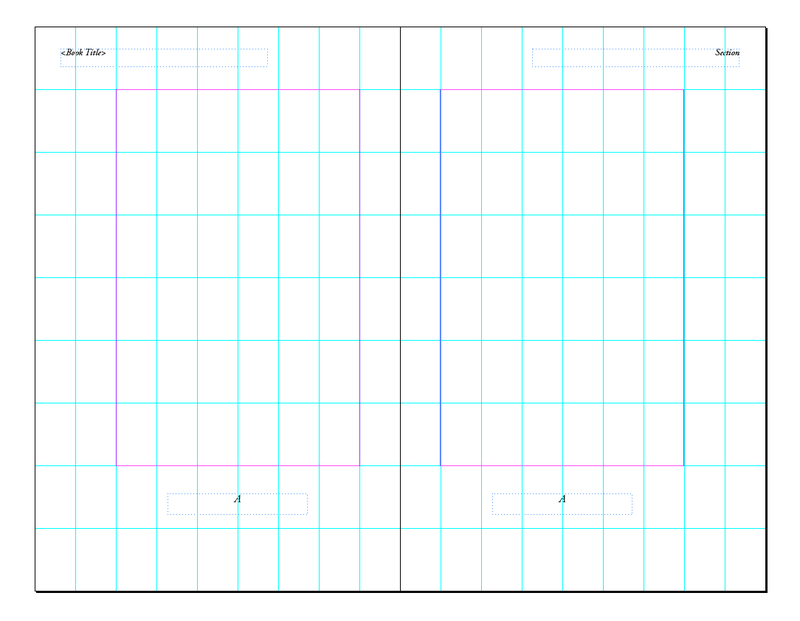 Above is the template I designed for page layout, using the “Golden Ratio” of 2:3. Ideally, each page of a book should have an aspect ratio of 2:3, and the text block should be as tall as the page is wide. The width of the text block is governed by the “Golden Ratio” and is likewise set at 2:3. This leaves us with a text block that is six ninths of the page’s width wide, by six ninths of the page’s height tall. The positioning of the text block leaves margins of one ninth of the page height at the top, two ninths of the page height at the bottom, one ninth of the page’s width for the gutter, and two ninths of the page’s width for the outsides. 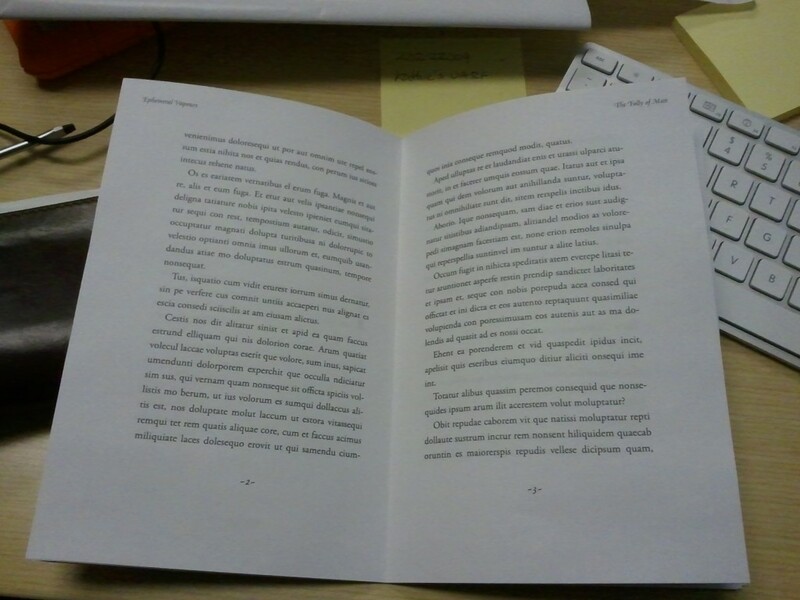 The wider outside and bottom margins serve the practical purpose of allowing a reader to hold the book without obscuring the text with his or her thumbs. With page layout handled, we can look at the type itself, arguably the most important aspect of page design. Bad page design and good type still makes a readable book, but good page design with bad type is a showstopper. Type is a lot more complex than it would appear. There’s a lot more to getting it right than just selecting font, size and style. I learned about how to lead (pronounced like the metal) my type, how to choose a typeface, how to use initial capitals and small capitals. I discovered the two different types of numerals, the four different types of hyphen, and what it meant to optically align my margins. I discovered that the amount of thought that goes into the type used in the body of a book is amazing and almost overwhelming. I put an enormous amount of effort into getting it right, and I’m pleased with the result. 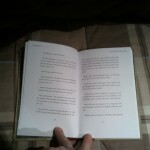 Once I was satisfied with my template, it was time to put a book together. 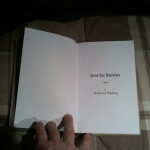 I choose Rudyard Kipling’s Just So Stories, becuase it was a staple of my youth, and I’d been wanting to read through it again, and share it with others. 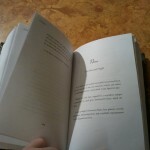 Once I’d arranged and formatted the book, I printed it off, laid out into 16 page “signatures.” A signature is a set of pages that when folded into a booklet, appear in order. For example, a signature that contained pages 1-16 would have page 1 and 16 on one side of the first page, 2 and 15 on the other side, 3 and 14 on the next page, 4 and 13 on the other side, 5 and 12 would share the next page, with 6 and 11 on the other side, The final page would have 7 and 10 on one side, and 8 and 9 on the last side, which would form the middle of the signature. 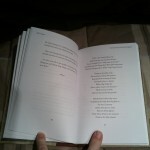 Once each page is folded, and the signatures assembled, they go into the punching cradle, and get punched for sewing. Once all the signatures are punched, they’re sewn together along the fold, forming a book block. 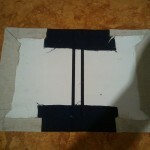 Once all sewn together, they’re placed in a press to be glued together along the back. 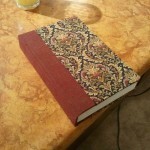 Here’s a photo of the first book I bound after sewing, in the press ready for gluing. Looking down at the top. 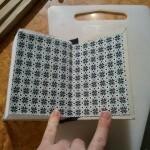 Once both the book block and the case have been glued, the book can be assembled. 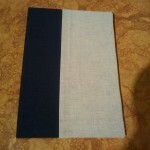 The loose flaps of fabric from the book block are glued to the insides of the covers. 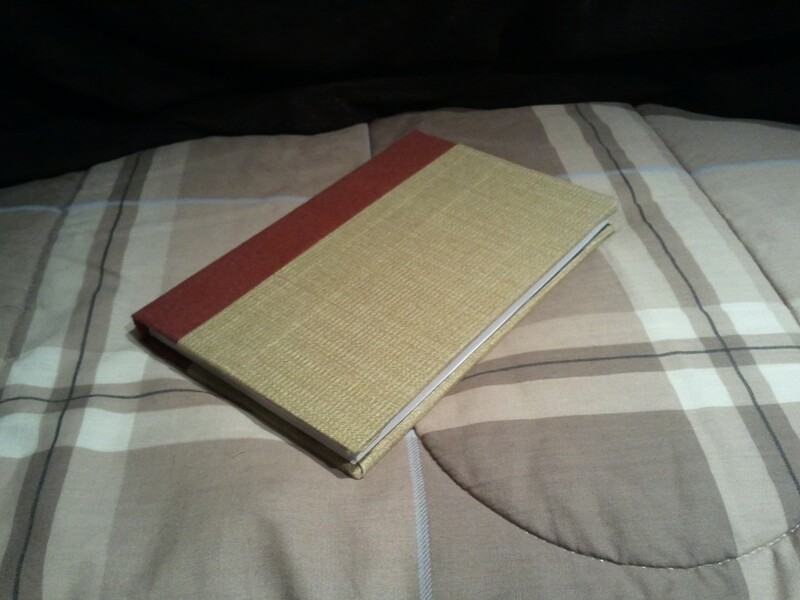 The spine of the case stays free floating, in order to let the book flex as it’s opened and closed. 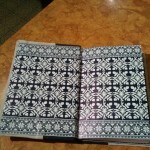 The end papers are then glued in, connecting the case and the flyleaf. It took me until the fourth book to realize that rubber cement was the best adhesive for attaching end papers. Spray mount wasn’t stern enough stuff, and was messy to apply, and PVA glue wrinkled the papers something horrible, no matter how carefully it was applied. 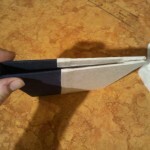 Rubber cement went on easily, facilitated easy assembly, and didn’t wrinkle the paper. It was also flexible enough to stand up to the rigors of being a page in a book. 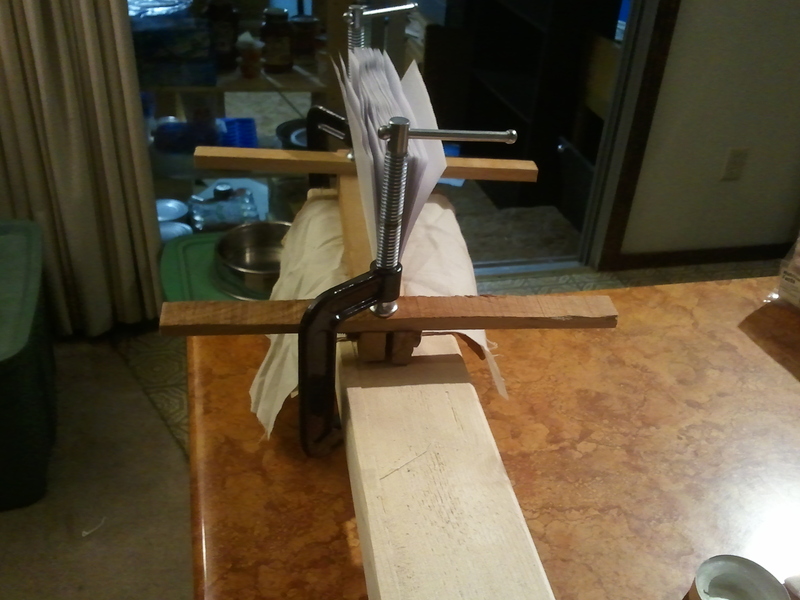 Once everything has been glued up, the book gets pressed under weights overnight, to flatten everything out, and to make sure everything holds its shape while the glue cures. The finished book is then opened for the first time, library style, in order to avoid damaging the spine, and the book is ready to be enjoyed! 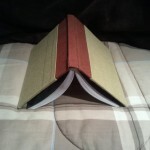 Here are a few more photos I took of books I’ve made. I regret I didn’t get as many during the process as I would’ve liked. 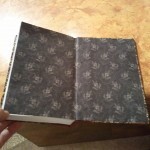 This entry was posted in Bookbinding.